This is my last post on this blog before I start my new Acumatica Reports blog (click here). The new blog launches next Thursday at 4:00pm Eastern over at TimRodman.com. In this post I’d like to give a quick recap on this blog and my experience getting acquainted with Acumatica. I completed the R180 Abbreviated Business Intelligence course tonight which is a really short course that just points you to some videos on the Acumatica website and then you take a test. In the Favorites and Usability Features video, it talks about how you can be reviewing a customer invoice, then a vendor calls wondering if a bill has been paid. You can jump to another screen, then go back to the customer invoice screen, and it will remember which invoice you were looking at. I hadn’t noticed this because I always use the Google Chrome Duplicate feature when I need to jump quickly to another screen. I have to admit though that this is a nice feature. Sometimes it’s the little things like this that make a person really like an ERP system. The ability to add an inquiry screen to a dashboard. I haven’t really looked into the dashboard feature that much yet, but I did recently “discover” the inquiry screens and the way that you can create your own custom inquiry screens. I also got a terminology lesson. Even though the inquiry screens are in the Explore folder, they are called “inquiry” screens, not “explore” screens as I was calling them. I leaned toward calling them “explore” screens because I was influenced by my Sage 500 ERP terminology. I stand corrected! The financial report writer. I did one post on this a while ago, but, other than that, I haven’t really looked at the financial report writer. The more I think about it, the more I realize how bold of a move this is. 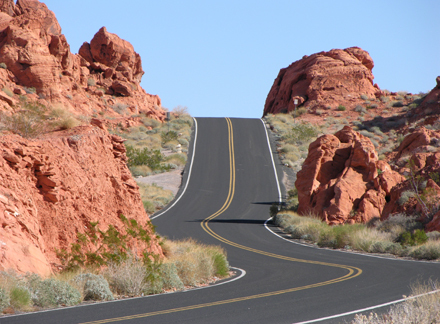 In the 1990s, most mid-market ERP systems relied on FRx for their financial reporting which was a 3rd party application. Acumatica’s approach to rely on 3rd party developers to build industry vertical applications on top of Acumatica allows them to focus on the core product which includes their own report writer program. It’s nice to have this built into the product without having to integrate a 3rd party application, especially when it comes to something as sensitive as your company’s financial data. The respecting of security policies during imports and in inquiry screens. I haven’t look at security much yet, but I know that Acumatica allows you to go beyond screen-level security to control things like who has access to certain GL Accounts or certain Vendors. There might also be the ability to control security at a field level, such as read-only access to the primary salesperson field on a customer (however, I’m not sure if this is possible yet). The point is though that the imports and inquiry screens use the same business logic that the regular screens use and they respect the security settings for the specific user. No more setting up a separate user that has unlimited permissions for the sake of importing data. 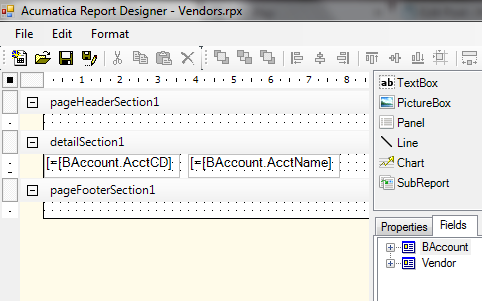 Also, no need to design multiple reports with different sections hidden because the security will automatically restrict access to certain data depending on the user who is running the report. You can design one master report with the confidence that the users will only be able to see the data that they have permission to see. 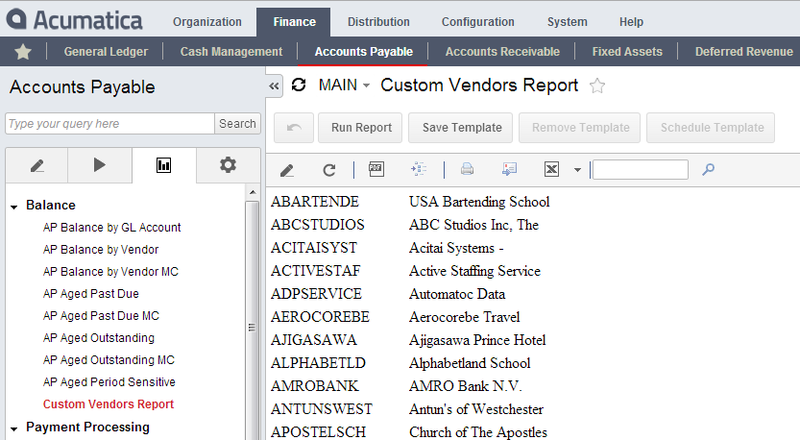 I made a previous post about how I wondered why Acumatica needed it’s own report writer when it could have utilized another web-based report writer like SSRS. I hadn’t considered the affect of security. 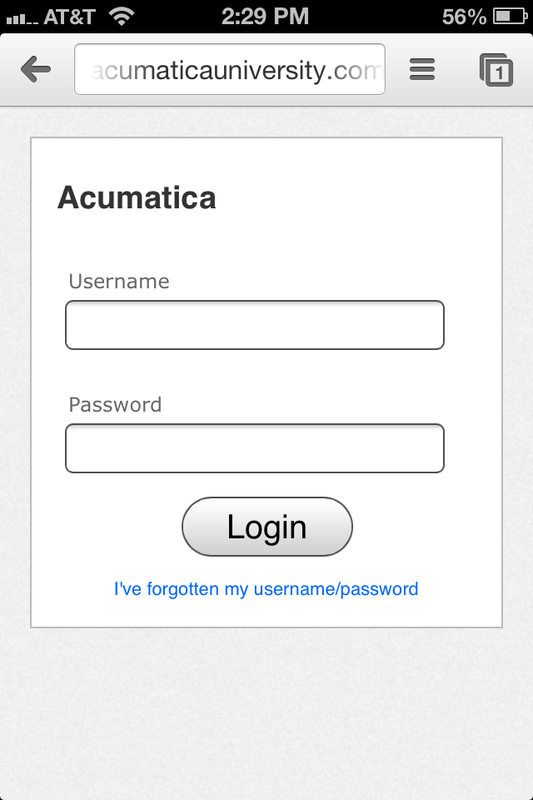 By making their own report-writer, Acumatica was able to make it respect user security. This is pretty cool. This week I passed the F140 Advanced Cash Management (V4.0) course. It’s a pretty short course and it didn’t take too long. The payment reclassification feature stood out to me this time around. It’s nice that you can get all your deposits entered even though you might not know who the customer is, then associate the customer later if needed. This way you can easily do daily bank reconciliations every morning, even if you don’t have all the information for each deposit. 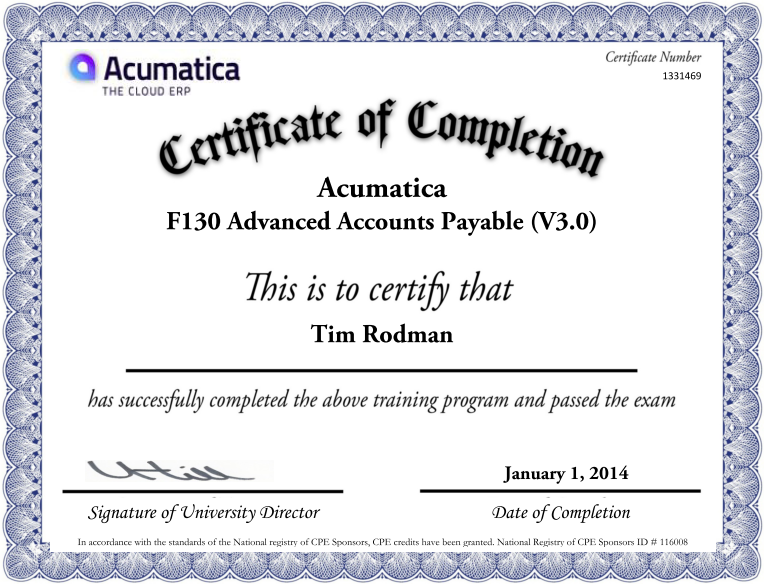 This week I passed the F130 Advanced Accounts Payable (V3.0) course. I like that you no longer need to schedule an appointment with an instructor in order to take the exam. You can just answer the exam questions while logged into the Acumatica University website. Then, once you pass, your certificate appears immediately next to the course name on the Achievements tab. While going through the course features, I noticed the Approve Bills for Payment (AP502000) screen which I hadn’t noticed before. I’m assuming that this would be used by the CFO (or someone with approval authority) to approve payments, but I’ll have to look at it further in the future to figure out exactly what it does. Another thing I began to wonder while going through the course is if Acumatica has the ability to handle invoice approval routings where you could scan invoices and key-in information to be routed to people in the organization who have approval authority on invoices before they become actual bills in the Accounts Payable module. Maybe there is already a 3rd party developer working on this? Lastly, I noticed on the bottom of my course certificate that Acumatica is registered with the National Registry of CPE Sponsors. I didn’t even know about this registry since I haven’t been renewing my CPA license in an active status and therefore haven’t had to deal with getting CPE credit. So, it’s interesting to know that there is an official registry for CPE sponsors. I looked up the Acumatica sponsor ID # (116008) on this website because I was curious why the hours aren’t listed on my course certificate. Unfortunately, it appears that Acumatica is only approved for the Group Live delivery method which means that you would have to attend one of their courses live in order to qualify for CPE credit. This explains why the hours aren’t listed on my course certificate. I also noticed that the address is the old Virginia address for Acumatica which makes me wonder if this whole CPE thing is something that they still care about. I hope it is, because it would be nice to somehow get CPE credit for Acumatica learning in the future. 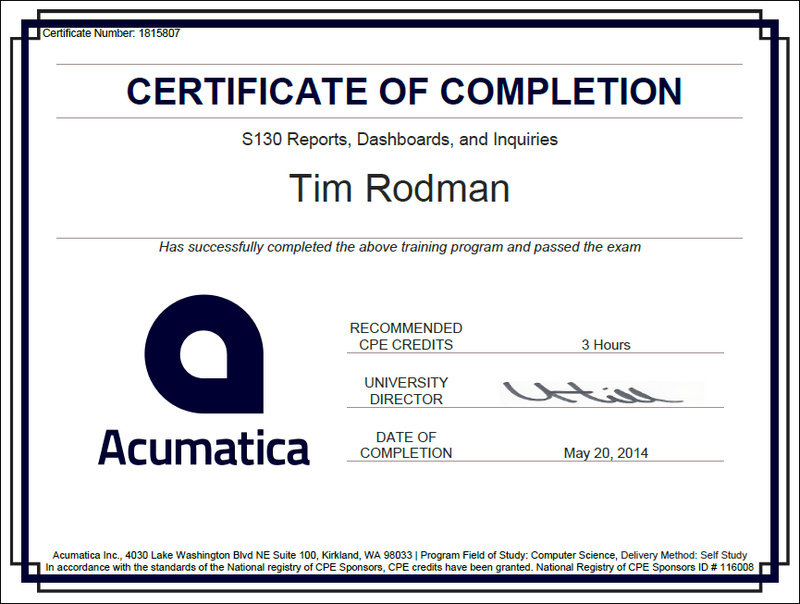 I’m starting to gain a little bit of momentum in getting through the Acumatica University courses correctly. Tonight I passed the F110 Advanced General Ledger (V3.0) course. One of the things that stood out to me this time around is the hard closing of sub modules. 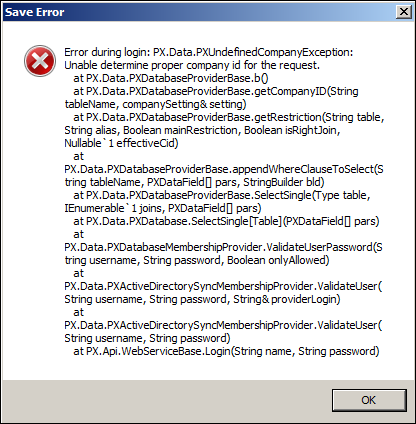 The product that I currently use (Sage 500) is just now finally incorporating this into their current version (7.5). It’s nice that Acumatica is including this from the beginning. As first I was disappointed and thought that the feature wasn’t working. However, I then remembered the Allow Posting to Closed Periods checkbox that is in the General Ledger Preferences (GL102000) screen. Apparently, this is checked by default in the demo company. So, it looks like the feature is working (whew!). 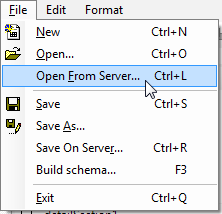 Also, it’s nice that Acumatica gives you the option to hard close sub modules or not. It’s up to you. Today I listed to the DN003 – Developer Network – Tech Tuesday course on my iPhone while vacuuming. I kept an eye on our one-and-a-half year-old daughter while my wife was at the gym, got some chores done, and learned some more about Acumatica. Now that’s some good APAL multi-tasking. Tech Tuesdays are a conference call and screen-sharing session given every two weeks for developers. Most of the info is over my head, but I am able to still pickup some useful tips and tricks. The recorded sessions are available on the http://www.acumaticauniversity.com website. So far, they run about an hour. I can choose a course and play the audio and video right on my phone. The only downside is that it plays in the phone’s browser so I can’t lock the screen if I want it to keep playing. This causes the battery to drain a little faster than it normally would and I have to make sure not to accidentally touch the screen, but it’s not too big of a problem. The convenience of having Acumatica videos available on my phone really helps to put the “perpetual” in Perpetual Acumatica Learner. I can even learn while vacuuming! I finally finished the course on multiple companies. 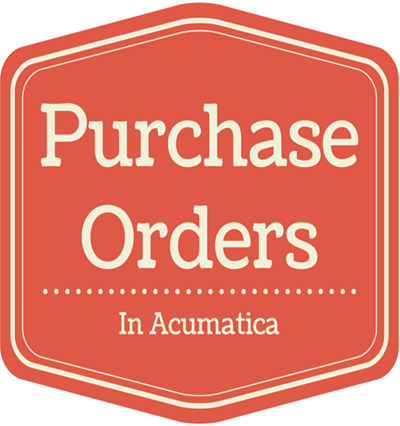 There are two ways to configure multiple companies in Acumatica: separate branches and separate companies. It seems to me that what I typically think of as companies are actually going to be called branches in most cases in Acumatica. (Example 1) A central headquarters with multiple locations or multiple branches that have separate operations. The accounting staff are located in the central headquarters. All transactions are posted in one ledger. The branches are not separate legal entities and no automatica inter-branch transactions are generated. Access rights can be maintained separately for each branch. 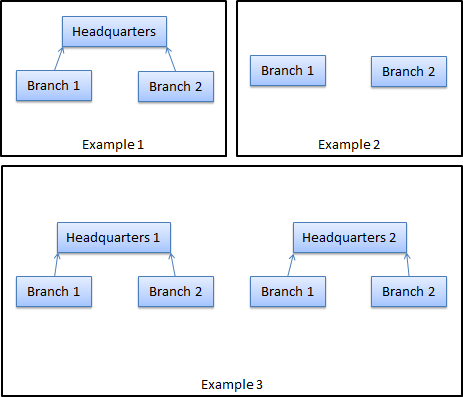 (Example 2) Each branch is autonomous. Each branch is a legal entity. All transactions are posted to one ledger that is shared between the branches. Most vendors and customers are shared, but some are associated with a specific branch. 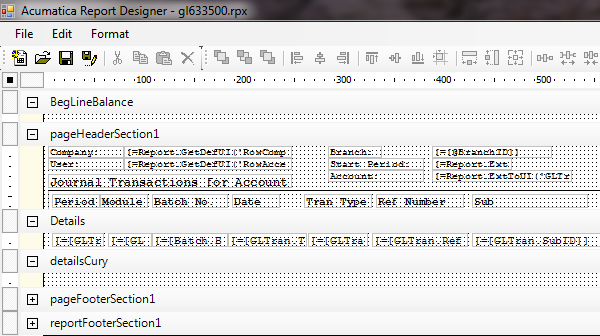 Inter-branch transactions are automatically created. 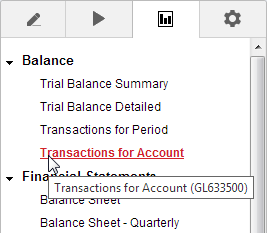 Some GL Accounts and GL Subaccounts are assigned to a specific branch. I’m currently going through the F120 Advanced Accounts Receivable (V3.0) course which employs the most extensive set of videos that I’ve encountered so far. The lady who recorded the videos has an accent that takes a little while to get used to, but I really like her enthusiasm. Also, there is an advantage to her not having a stellar command of the English language because it forces her to read from a script (at least it seems like she is reading from a script). This results in her being able to communicate her point in a succinct way. Too many training videos these days are so wordy and slow moving because the person who recorded the video is making it up as they go along. Hopefully she will continue to be the presenter for the rest of the Financial module, but the videos were recorded back in September 2012 on version 3.0 so she might not be with Acumatica anymore. It sounds like a “you have to experience it to believe it” pitch for an exotic vacation getaway. I can’t wait to experience the system behavior! Like I said, I appreciate the enthusiasm. My biggest gripe so far is the video quality. Sometimes it’s difficult to read what is on the screen. Maybe my screen resolution (1366×768) is too high? I got a response from the email that I sent to [email protected] and the instructor recommended that I go through all the Financial courses, then we can look at everything in one sitting. Some of the screen names were a little different since this is a 3.0 course (no 4.0 available yet), but the screen IDs saved me. I still really like that you can refer to screens by their ID (eg. GL301000 instead of “Journal Transactions”). The Cash Manager Configuration exercise occupied page 36 to 68 in the 157 page .pdf file that I downloaded from Acumatica University. Nothing too earth shattering here. Lots of setup options: what payment terms are valid for which cash accounts, how to link a GL account to a cash account, whether or not an account is used in AP/AR/Remittance, and even whether or not to upload a check signature image. There were a few mistakes in the training guide which gave the wrong screen ID or the wrong path to a screen, but nothing too major that I wasn’t able to figure out. So far, the configuration setup reminds me of Dynamics GP because you have the ability to control things at a very granular level. This is a surprise to me because I expected that these kinds of options would come later in the life of the application. For example, the fact that you can associated which cash accounts a payment method can be used with is a feature that I didn’t expect to see. Also, I noticed that the check form had the same screen ID format as the other screens. I was able to type in the screen ID using the trick listed here and it took me right to the check form. Yet another cool feature of a web-based application. 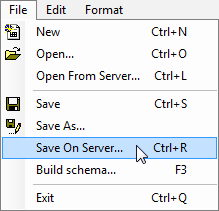 I could reference a screen in an Excel file, a Word document, a SharePoint page, etc. and clicking the link would take me directly to my screen. I’ll experiment later, but I’m wondering if I might also be able to embed data in the URL so that a link would not only open a specific screen, but also fill in certain fields on that screen. Today I received my invitation email with a link to create an account on the Acumatica University training platform! This gives me access to an entire library of training courses. I like the online format. With the previous ERP products that I learned, I had to dust off photocopies of old training manuals. Having the information online is a big improvement. 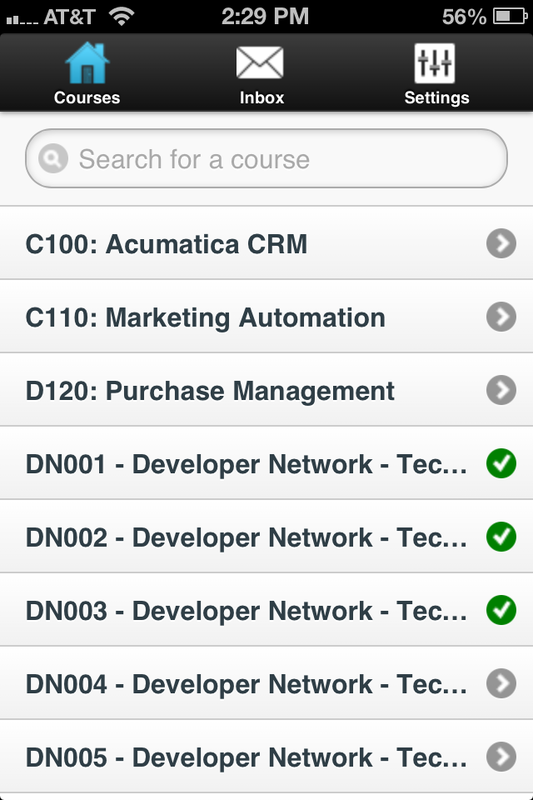 Taking a quick glance, it appears that there are 41 courses available. I’ll be checking with ARCVAR to see which one they would like me to start on first.